Can I Replace AD with JumpCloud? Home » Blog » Can I Replace AD with JumpCloud? This may not come as a surprise, but one question that we often get asked is whether or not JumpCloud® Directory-as-a-Service® (DaaS) can act as a replacement for Active Directory®. The short answer is yes! That is exactly what we created this platform to be, and we are continuing to add and improve the platform with that goal in mind. The longer answer is that everyone’s infrastructure is unique, and there are key differences between JumpCloud and Active Directory. To get the answer to whether or not you can replace AD with JumpCloud for your specific environment, we recommend that you contact our sales specialists here. But why are organizations trying to replace AD with JumpCloud, and what is the draw of the cloud-based directory JumpCloud offers? Those question will be answered in the following blog post, along with further details about the JumpCloud platform and the process of migrating away from AD. The IT community has been intimately familiar with Microsoft® Active Directory since the platform’s debut in 1999. In fact, AD has held a near-monopoly in the directory services space for nearly two decades now. Microsoft was able to parlay their dominance in the enterprise with Windows systems and solutions into dominance in the directory services market. Back in 2000, nearly 97% of all devices in use were running Microsoft operating systems (Forbes). With this kind of an environment in the office, it just made sense to go with a Microsoft tool to manage them as well. While Active Directory worked fine in the past, it has struggled to keep pace with fast-paced changes in the IT environment. When everything was Microsoft and on-prem, AD had no problem integrating with everything admins needed it to. Now, Microsoft only accounts for around 20% of the devices in use (Forbes). With the advent of web applications, cloud servers hosted at AWS and GCP, Mac and Linux systems, cloud and physical storage solutions such as NAS appliances and Samba file servers, and many other non-Windows solutions, the connectivity Active Directory once had is fading fast. This fading functionality is causing significant issues for IT organizations, and the required workarounds are creating many headaches for admins. Some third party solutions have popped up to help address issues of AD, but each one adds more expenses and more complexity. Whether it’s identity bridges, privileged identity management solutions, web application SSO platforms, or any other IAM tool, each additional platform that is added to an infrastructure means more that admins need to stay on top of. While this approach is an improvement over AD, it still makes for a very complicated identity management strategy. If that wasn’t enough, the massive trend of moving to the cloud is another consideration admins need to keep in mind. Most organizations are shifting their IT infrastructure to the cloud, and the more infrastructure that moves to the cloud, the less Active Directory can touch natively. Even Azure AD, which is Microsoft’s approach to IDaaS, isn’t a complete AD alternative in the cloud. A Microsoft representative said it himself in a recent spiceworks thread here. 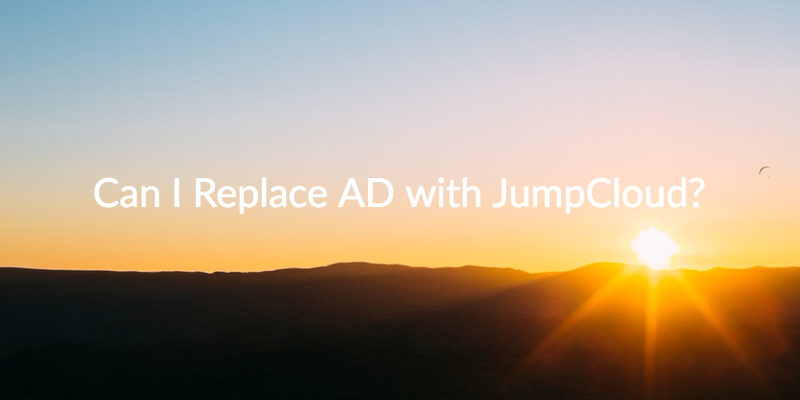 Can You Replace AD with JumpCloud? With all of the current and impending challenges of Active Directory now clear, it becomes obvious why admins are moving away from AD. But it’s not something you can leave without having another solution to replace it. As a result, many IT organizations are looking for a new solution that can act as the core directory service, while being cloud-based, vendor neutral, and platform agnostic. The good news is that JumpCloud’s Directory-as-a-Service fits the bill. We created JumpCloud DaaS for just that reason: to be an alternative to both Active Directory and LDAP. 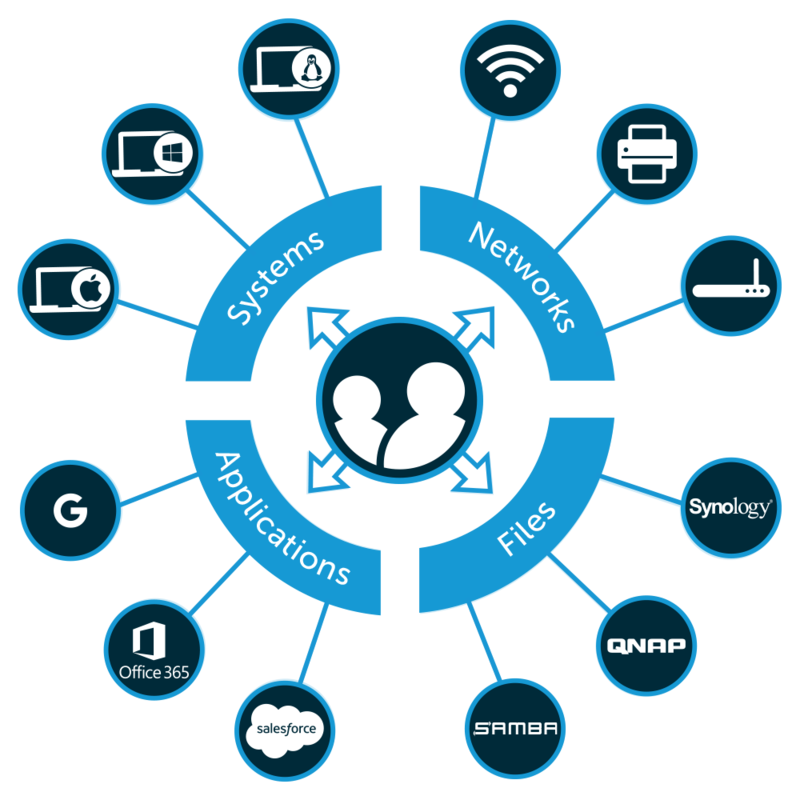 The identity provider is one of the last core pieces of IT management technology to make the leap to the cloud. The “jump” for the IdP is long overdue. JumpCloud Directory-as-as-Service was built to be the SaaS directory service that admins want. With this unified cloud directory, admins can securely manage and connect their users to their networks, applications, files, and systems, all regardless of the platform, provider, protocol, or location. The directory is truly built to be an open solution that lets admins make all the decisions for their environment. Are you interested in getting a directory built for the future of IT? Then you might want to give Directory-as-a-Service a look to learn how you can replace AD with JumpCloud. You can get a free live demo by signing up here. If you are more of a hands on person, you can also check out the platform with a free account. With a free account you get full access to our platform for up to 10 users forever, meaning you have the perfect opportunity to test everything out. We want to build the directory that you want to use, so make sure to contact us if you have any feedback or questions. Check out Directory-as-a-Service today!